Its new platform means that AWD is a distinct possibility. The 2020 Sonata will be arriving in the US during the course of 2019 and aside from a few official images and the confirmation of a turbo powerplant for the US, Hyundai has been keeping most of the details under wraps. We since discovered more info on the upcoming sedan thanks to Asian Petrolhead and a press conference held this past Wednesday in Seoul has revealed even more fun facts. 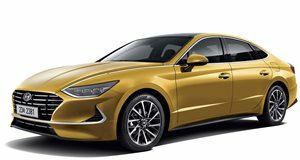 The 2020 Sonata will be utilizing the brand-new N3 platform that, according to Jae Young Kim, director of Hyundai’s product division, will also underpin a number of upcoming models. The mid-size sedan market is not quite as popular as it has been in the past but Hyundai noted that it is still the fifth-largest market within the US and the Sonata will definitely broaden its reach were it to be offered with an AWD option. While the more luxurious and expensive luxury sedans from BMW, Audi and Mercedes tend to be offered with AWD options, the segment the Sonata falls into is curiously short on AWD options. Aside from a few offerings from Subaru like their new Legacy and the upcoming Nissan Altima, the market is dominated by front-wheel-drive offerings. The Sonata should be a strong offering in this segment and a good match for these AWD vehicles, not only when it comes to bad-weather ability but also thanks to its hi-tech specifications and sleek new styling. The full details of the 2020 Sonata will be revealed at the 2019 New York Auto Show later this month.